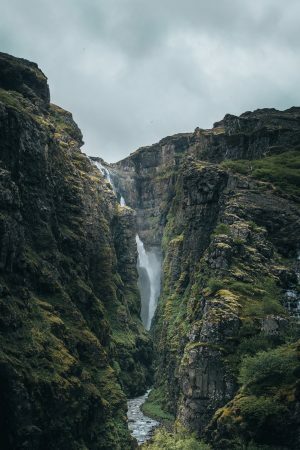 This unique guided walking tour to Mount Esja certainly is one of its kind! 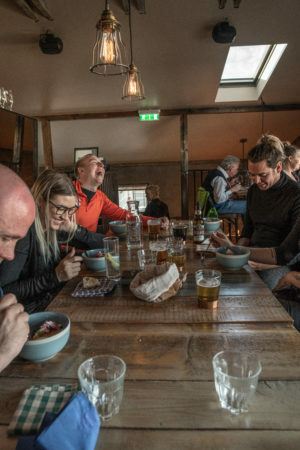 Not only will you get a great guide who knows all about Reykjavík and Mount Esja, but we’ve added food, drinks and a pool trip as well! This tour comes highly recommended by travellers and locals due to excellent value for money and overall quality. As soon as you enter Reykjavík city you’ll notice Mount Esja towering over the city in the distance. 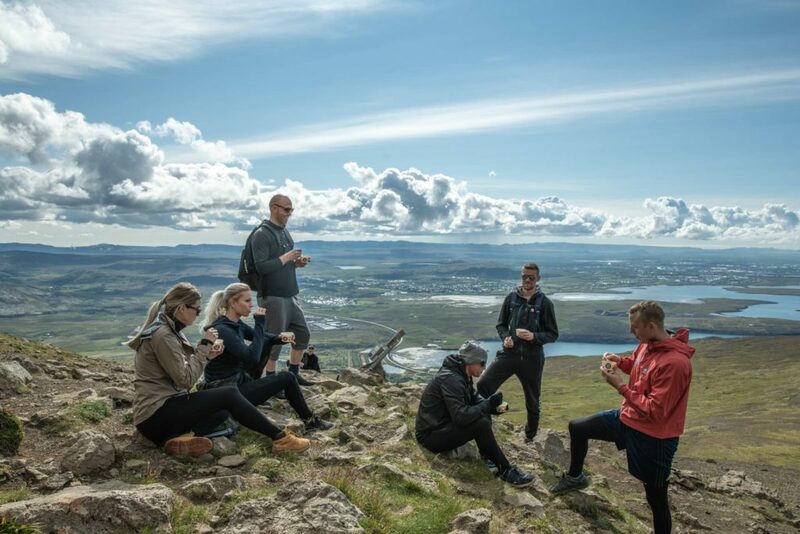 It’s a very popular hiking route for Icelandic locals and provides a fantastic view over the city. There’s even a group of (crazy) people who run up Mount Esja every day. But don’t worry, we´ll take our time hiking up so you´ll have plenty of time to admire the view and chat with the guide. 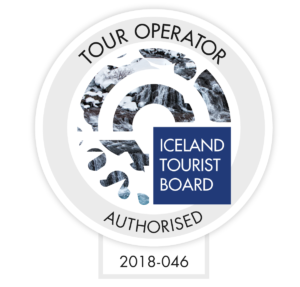 The day starts with your guide picking you up at your hotel, guesthouse or one of the bus stop downtown in Reykjavik(see list of bus stops here). Together we get on the bus that takes us to Mount Esja. On the 30 min ride to the mountain we keep you entertained the best way we know how: playing Icelandic music. 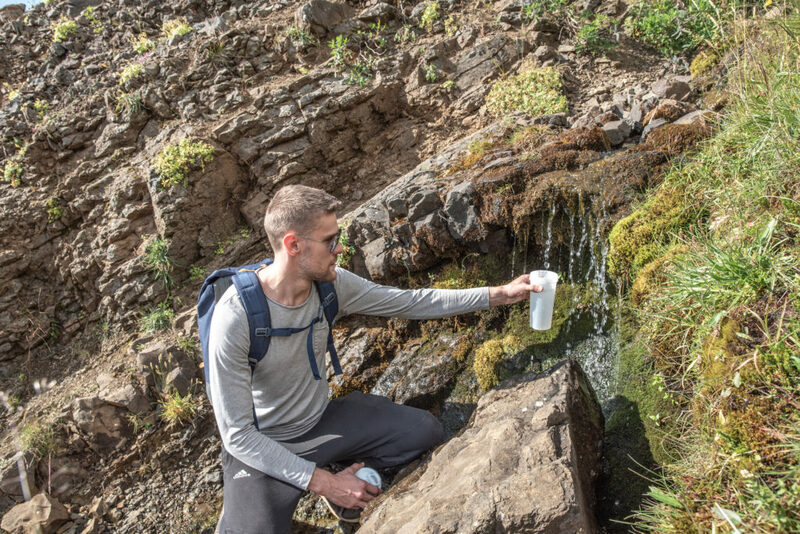 Before yo start hiking we make sure to stop by the brook and fill up our water bottles with fresh Icelandic spring water. You hike up to the landmark rock of Steinn (“Stone”) near the top of mount Esja. There you get some local refreshments to gather your energy for the hike back down. 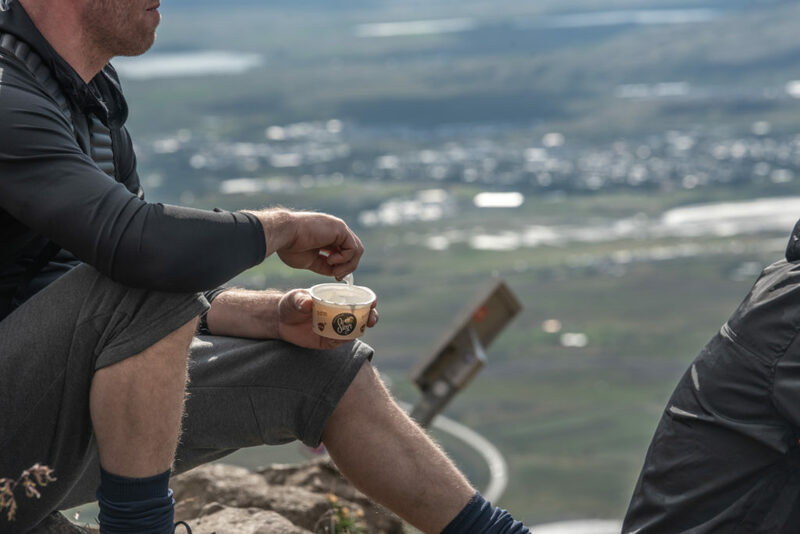 Sitting there, enjoying the Icelandic delicacy while admiring the view isn’t something you´ll soon forget! After the hike you can rest your tired feet and body at Lágafellslaug swimming pool. Of course, you don’t have to get in if you don’t want to. But if you do, make sure you try out the lovely hot tubs, steam bath and sauna. 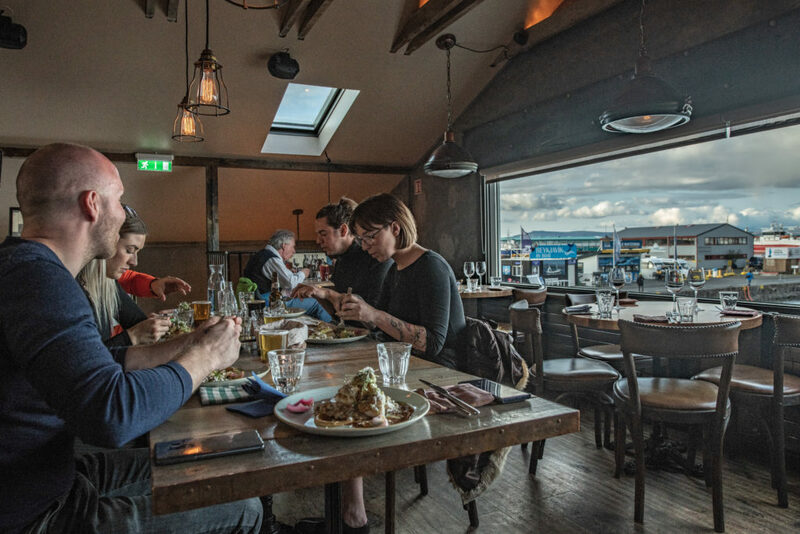 We´ll take you back to Reykjavík and drop you off at the final stop, Kopar restaurant. But we don’t want you to leave hungry, so we’ve arranged for you to have a taste of Icelandic fish, cake and a selection of beers! It’s the perfect way to end the trip and you can enjoy the rest of the day exploring Reykjavík. In winter time, we will provide studs for you. Please bring: Good hiking shoes, water bottle, appropriate clothing depending on weather, swimwear and towel (it’s possible to rent them for a fee at the pool). Since you end up in a restaurant, we highly recommend an extra set of clothes to change into after the pool trip. 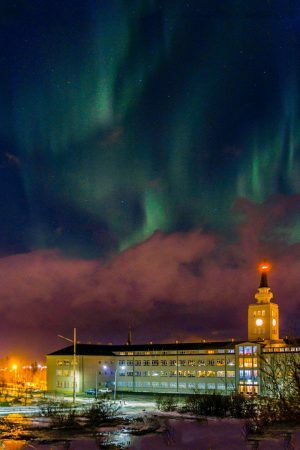 This is how you make the most out of your trip to Reykjavik! Loved my experience! 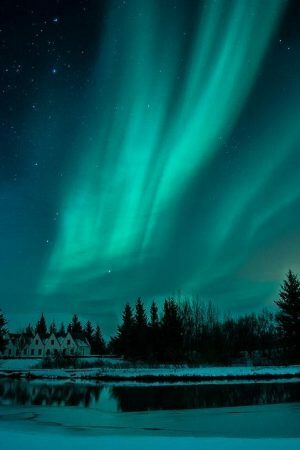 I had a one day layover in Iceland, and knew I wanted to make the most of my trip and experience it like a local. I took the guided tour to Mt. Esja, which was followed by a trip to the local pool center Lagafellslaug, and then Salt Restaurant in town for a 2 course meal and beer tasting. My tour was led by Sven, 1/2 of the duo who started Outventure. 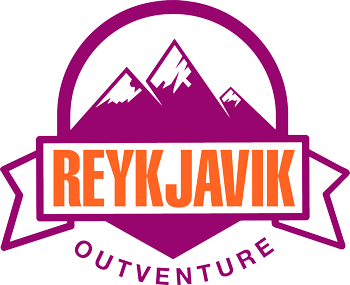 Throughout the day, I got to ask Sven questions about living Iceland and how Outventure started. The owners have such an interesting story–they were friends who met while sailing for 4 years, and had an idea to start a company that could connect them with tourists. The river at Mt. Esja is thought to have some of the freshest water around. Bring an empty water bottle because you’ll want to fill it up and savor it while you’re there! After attempting a hike to the Stone where we were set to enjoy Skyr (a traditional Icelandic treat that’s similar to sweetened yogurt), we went to a nearby center that had a pool, sauna, steam room, waterslides, and featured hot and cold tubs. The cold tub was as low as 4 degrees, and it was fun to challenge myself to stay in. It’s said alternating between the hot and cold tubs is great for your immune system and muscle recovery, and athletes frequent the facility to do so. The food and beer at Salt were tasty, and not that different from American food (save for the amount of salt the fish was seasoned with). We enjoyed a fish with sauteed kale followed by dessert and a flight of 4 different beers. I learned so much about the food, work, and nightlife culture throughout my day. 2 things I can’t wait to try next time are their signature liquor Brennivín (translates to Black Death or burned wine–as if that isn’t intimidating) and rotten shark, which you can’t find anywhere else. The hike was intense but the views were definitely worth it. 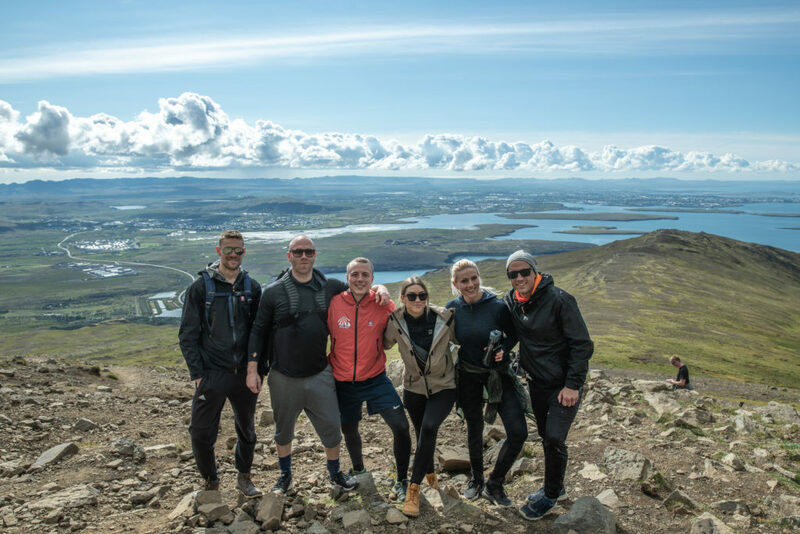 You can see all of Reykjavik and more – you set the pace (which was great, I was really drained when we reached the summit). The downhill was much easier but a bit muddy and slick in places. Still, a great hike in the morning! We took a stop over in a nearby public pool (definitely bring swimwear and a towel – a change of clothes probably helps too as your hiking gear might be drenched in sweat). A bit of hot and cold to help ease the muscles followed by a fantastic lunch on the harbor and a local brew. Definitely recommend the experience! 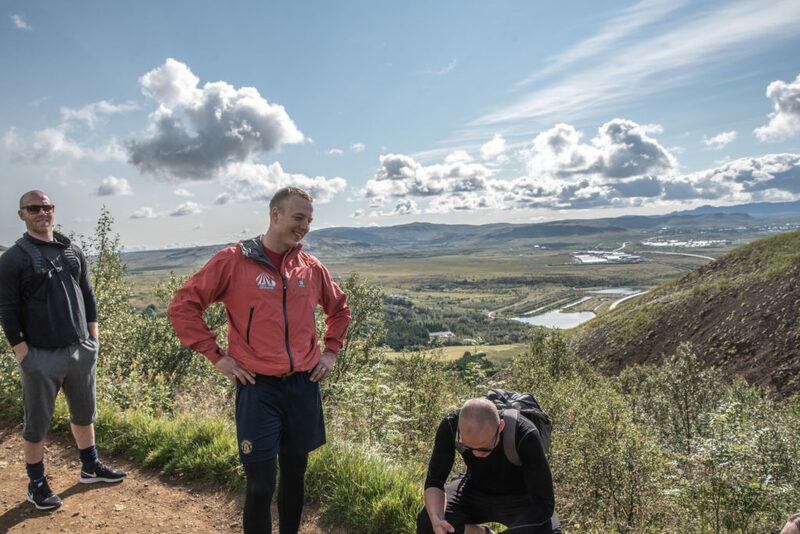 Exercise, Icelandic nature, so much fun – all in one! What a great tour ! 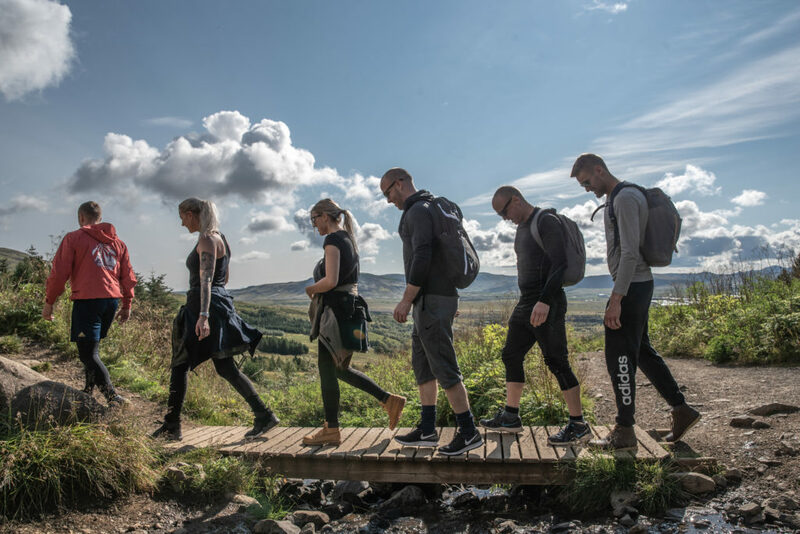 An amazing way to experience one of the most popular hiking trail of people living in Reykjavik city. It was not “touristy” so we could enjoy every bit of the mountain and watch over Reykjavik city at it’s finest! The guides were great and although it’s a pretty tough trail to hike, it’s totally worth it. The view was amazing.. and afterwards swimming and sauna were the perfect way to end the exercise. The food was excellent and everything just …Perfecto !! Thank u agaiiin Reykjavik Outventure ! Was travelling alone and booked a trip to hiking Esja. My guide picked me up from my hotel and told that i would be only customer for that day so i got privat tour! Hiking uphill was a great workout and scenery was worth it. Being little bit offseason there were just few other people on the mountain. After that soking in hot tub and very tasty fish in restaurant made the day memorable. After all it didn’t feel like guided tour more like spending a day with a friend!